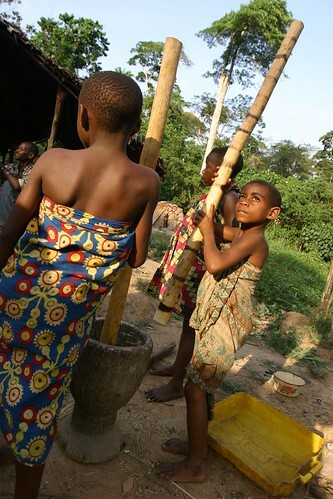 Young pygmy girls pounding cassava (photo Kim Gjerstad). Masimango or Maître in the western Reserve. Maître when captured more than five years ago. 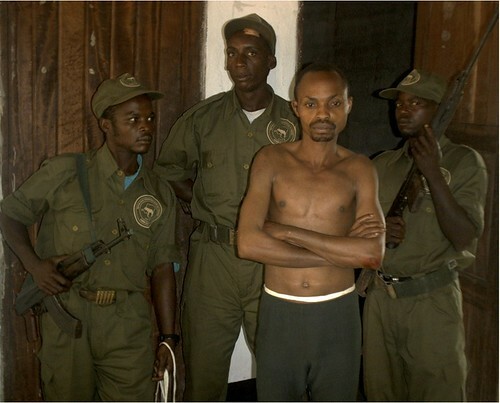 He was soon released after being transferred to government justice in Bunia (photo ICCN). By terrorizing the villages and pygmy camps the criminals make themselves lords of the forest. The warden reported that in the two weeks before his letters, Pygmy women were raped in the gardens behind the village, Badengaido, and volleys of rifle shots were fired pre-dawn to intimidate villagers in Adusa, Molokay and Seti. The urgent call for help went unanswered. Neither the government nor top miliatry authorities were motivated to enforce law and order. Two years later the local army contingents are still supplying the poaching gangs with guns, means of communication, and transport. Two years later (three weeks ago) one of these poachers, Morgan, attacked the Okapi station, killed seven people and shot all the captive okapi that were the Reserve’s totemic symbol since it’s creation. Morgan is still on the loose, still in the forest, still terrorizing villagers. 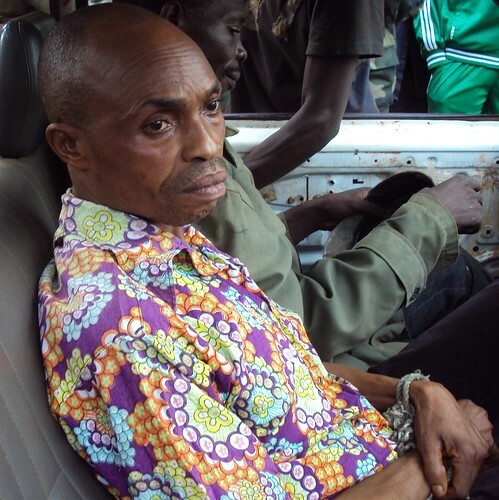 Maître, recently arrested with ivory, just west of the Reserve (photo Uvonn Unega). Maître, a second, equally infamous and iniquitous poacher was arrested early this week while carrying ivory to Kisangani. 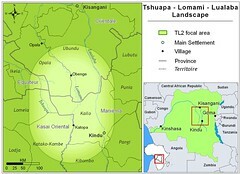 A young army captain, newly assigned to his Ituri post in Niania, made the arrest. We (the people of the Ituri Forest, the people who support the Okapi Reserve, the people who work for the Okapi Reserve) thank this captain for his sense of duty to the law he is assigned to uphold. But we also beg that Maître not be immediately released, as has happened before, to return to the Ituri as an even more hardened criminal. Yesterday a second arrest was made in another town close to the Reserve, Mambasa. The unidentified poacher was carrying 30 elephant tails. Thirty elephants are dead. He is in custody with Maître for trial and judgement in the regional center, Bunia. Perhaps the best news is that the population is rising up. In Mambasa there was a citizen’s march demanding security. And in the RFO the staff and guards are returning determined to do what the army hasn’t done – capture Morgan. They need arms and equipment. But I am confident that the pursuit will happen and it will be successful. BAD NEWS: Yes, Maître was released…almost immediately on arrival in Bunia. This report from several separate sources. See comment below. GOOD NEWS -maybe: Morgan has been captured. This from one source and waiting for confirmation. This entry was written by Terese Hart, posted on 2012-07-21 at 3:22 am, filed under Diamonds, gold and guns, Elephant, Law and Order. Bookmark the permalink. Follow any comments here with the RSS feed for this post. Post a comment or leave a trackback: Trackback URL. What is the relationship between Maitre & Morgan? Do you know if they work together ever? I wonder who supports Maitre? Its been confirmed that Maitre has been released. How on earth someone like Maitre can be arrested 2 times in the last 5 years and be released out immediately after being transferred to government justice in Bunia?!?!?!?! I’m wondering why rangers or whoever is interested in clearing up this corrupted world should continue to risk their own life for nothing…. This is the critical question. There is no national institution (justice, security….) that can be relied on. We must now rethink our protected areas in terms of close-to-the-ground alliances. It is a holding pattern, but it can be effective. The local institutions can be strengthened and will be of long-term importance.